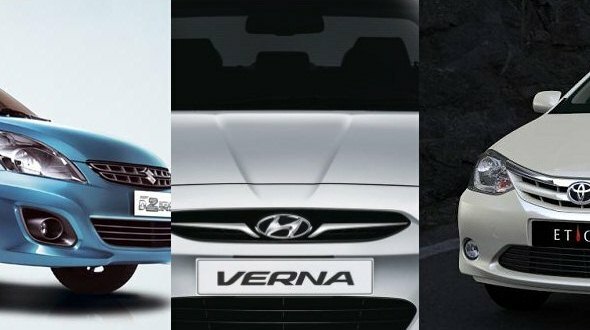 The Indian car market has seen some interesting changes in terms of sedan sales this June. Here we take a quick look at sedans between Rs.5 lakh and Rs.10 lakh to see how they have fared. First let’s take a look at the best selling sedans; then move onto the worst and subsequently study which sedans have seen a major rise or a major fall in their sales numbers. The top three spots have been filled by the Maruti Suzuki Dzire (13,741 units), Hyundai Verna (5,929 units) and the Toyota Etios (4,059 units). However the Dzire has taken a fall from May when it had sold 17,707 units and the Etios too has gone down roughly 200 units as it had sold 4,270 units in May. While some sedans have had a reasonable good month in terms of sales, others have not been so fortunate. The Fiat Linea, Ford Global Fiesta and the Renault Fluence hence sat at the bottom of the sedan sales chart with 184 units, 203 units and 208 units respectively. While the Linea and the Fiesta have fallen from their sales figures of 287 units and 257 units in May, the Fluence has actually moved up from 156 units in May. The Honda City has seen a major decline in sales numbers with only 1,254 units compared to the 3,753 units it has sold in May. The Mahindra Verito too has seen a drop from its 943 units in May to 444 units in June 2012. Cars like the Hyundai Accent and Maruti Suzuki Sx4 have sold 301 units and 408 units which is similar to their sales figures from May. « Hatchback sales June 2012: Maruti cars rule!